I love seed packets. Some of the vintage ones are real works of art and I would guess they are now collector’s items. Now seed packets are all photographed which is way more accurate unless the artist is very good but they sure aren’t artistic! This cute little card was another for my card class two weekends ago. I wanted to make some springy cards so pulled out my ‘ink-virgin’ seed packet wheel stamp. I apologize for the crappy stamping but I WAAAAY over reinked my Stazon brown so I was taking it easy as I rolled to avoid splotches thereby missing some of the image *SIGH*. I would have redone it but I was way behind in prepping for this class. I actually preferred it before I added the dots but again, I didn’t have time to redo it. I offered the option to my students and 4 out of 5 chose the dots. What do you think? Perhaps I could try the Cuttlebug Swiss dots embossing folder-more subtle? This looks much better IRL! I used SU! water-based markers and tried to blend them somewhat, like Copic markers, but it doesn’t work nearly as well! On the iris, I started to colour the upper petals and I realized the tip of the marker was slightly split. This gave a streaky look that very much resembles variegated petals common to irises! So of course, I ran with it! Click on the photo for a better-quality, enlargable version. One of my students coloured with blush around the flower on each packet and kept all the wording boxes the same colour. Looked really nice. I am going to try that next time. This card is actually a great one to make ahead without any sentiment. Then you can quickly add a sentiment at the last minute when you need a card; takes just a few seconds. 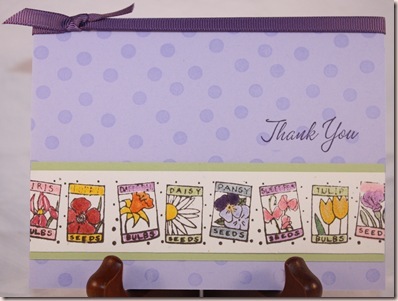 The style allows students to choose their sentiment too so it is a great card for classes. OK, time for another cutie patootie kid story. My baby is a big snacker. (Come dinner time he won’t eat much; he prefers to snack all day. Yes, of course, I try not too give him snacks too close to dinner but when he is hungry (always) he is VERY insistent!) One evening, I was eating Bits n Bites while watching TV and he was sitting not next to my elbow but pretty much on it, insisting on sharing. OK, so I started to give him some. He tried to grab some himself but he doesn’t get to handle food himself unless he is in his highchair to minimize mess! So I told him, “Mommy will do it.” I give him a few, then I slowed down because I was blurfing. He asked a few more times and apparently I was way too slow so he grabs my hand and jams it into the bag! Is that cute or what? In fact, he was so insistent, he jammed my hand not just into the bag, but right down to the bottom! He is amazingly strong for 22 months! Accessories: eggplant grosgrain ribbon and markers. Next postWanna See My Mess? I love this! I have that wheel and have not used it near enough!! Cute story on your little one – mine will shove books into my hand when he wants them read! They sure know what they want!! This is so cute! I love the purple!